Emma Rubenstein is a perfect party host. Even when it’s a really big party, with live bands and scores of people crammed into her house, that she and her roommates throw at least once a month. On a balmy February evening in southeast Atlanta, Rubenstein and her roommates clean countertops, replenish toilet paper, and start the popcorn machine in the spacious basement of their four-bedroom house. Arthur Cabral illuminates a movie projector next to the makeshift stage, where red-colored lights shine down, while Abigail Popwell sets up a machine on her bedroom windowsill that rains foamy bubbles over the fire pit in the backyard. “We want people to feel warm and welcome,” Popwell says. The Casa Nova is one of the newer additions to Atlanta’s vibrant do-it-yourself musical landscape. These venues, usually run out of people’s houses, follow previous iterations, like the now-defunct Cleaners and Yellow House, that pop up to fill a void in Atlanta's music scene. "Trying to play the Earl, or even 529, here is hard if you don’t know a million people, or have all the connections, or haven't been in the scene for a long time,” Rubenstein says. She and Cabral are part of tropical rock act Sad Fish, and the house doubles as a rehearsal space for the roommates’ various musical projects. She notes that DIY sites like the Casa Nova can also attract more diverse lineups and audiences than more established venues, because there’s less financial pressure to reel in a certain demographic or to make money through alcohol sales. No value assigned“I think it’s just easier for them to not have to worry about giving voices to people that are marginalized because — I’m not saying they’re racist or homophobic or anything — but they’re trying to make money.” Rubenstein says, mentioning other groups like the independent Punk Black that highlights people of color in its lineups. “In general, DIY spaces know it’s harder for these bands traditionally to be booked at bigger venues." There’s no entry fee for shows at the Casa Nova, except for cash donations at the door, and other than a couple of house-provided six-packs, it’s BYOB. That’s why a house show audience can range from teenagers to grey-flecked 30-somethings, and the lineups can push the boundaries of eclectic: one of its recent shows included a spoken-word rapper from New Orleans, experimental music from Switzerland, and a doom-metal band from Athens. Rubenstein, Popwell, Cabral and their fourth roommate, Lyle Baldes, met through Baldes' band Loudermilk & Moon. 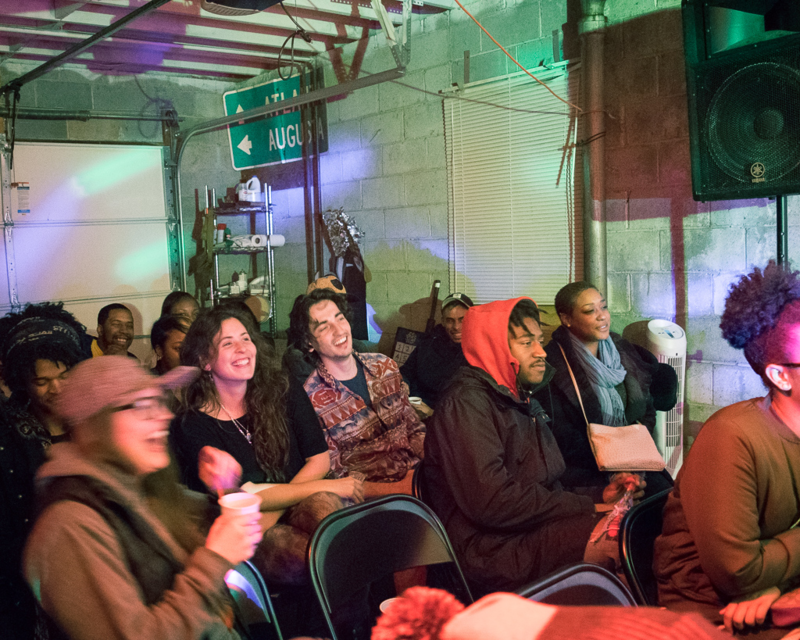 Rubenstein and Cabral used to throw shows together in their East Atlanta house, until noise complaints from new neighbors in the changing neighborhood threatened to shut it down. Their friend, performance artist and musician Daniel Scoggins, better known as Cousin Dan, recruited them to come fill a house next door to him. Their new house in Chosewood Park, located just off Cassanova St., is perfect for throwing shows, Cabral says, with a big yard, thick brick that better keeps noise inside, and a neighborhood where houses are further apart from each other. They’re still getting to know their neighbors, who are mostly families or other musicians. Cabral says they all just like hosting. Sometimes, they’ll make food for the guests. “We get worried that people will get hungry,” he says. Rubenstein’s Southern hospitality comes from growing up in a Marietta house with her grandmother, a no-nonsense but funny woman who came from Depression-era North Carolina. Grandma Helen always expected the house to be in top shape, with refreshments for visitors at the ready. Those lessons, and the small touches from all of the Casa Nova’s inhabitants, create warmth in the house that’s palpable at every event. Rubenstein hopes that the younger kids that come to her shows get inspired to do the same. "I hope it’s creating a drive to keep Atlanta going, because it’s not going to be run by the same people forever," she says. Peach Coven celebrates A Bloody One-Year Anniversary at the Casa Nova on Sun., March 12. $10 suggested donation. 8:30 p.m. Full moon ceremony and bonfire lead by Sarah Cavrak of Wild Moon Women. Fire dance by Caroline Croland. Musical performances by Femignome, Harlot Party, Casey Hood, Cuntry, Lauren Pararo, Lullahis with Gracie, and A Deer A Horse. Send a message for the address and directions.